Even though summer has come to an end, there is still time to soak up a little sunshine before the leaves begin to turn. The works featured commemorate those who have freed themselves of any inhibitions and chose to work in their cool, cool studio instead of relazing in the blazing heat of summer. While some of us oiled-up sunbathers hung by the sea with a pina colada in hand, these artists were knee-deep in fluorescent lighting and swam through piles of work to be made. This was not only intensive labor, but perhaps also their own way of relaxation; they were able to channel their energy into work that would have been much harder to produce when school was in full swing. 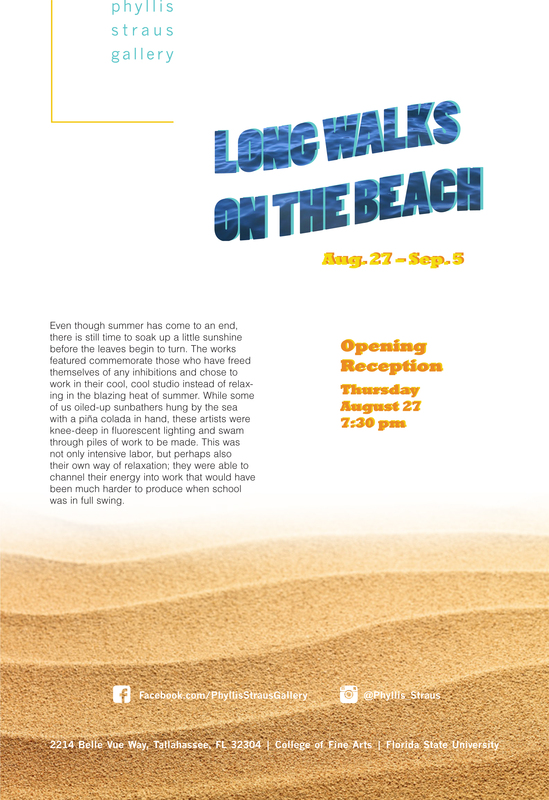 The Opening Reception will take place on Thursday, August 27th at 7:30PM in the Phyllis Straus Gallery. For more information about the Phyllis Straus Gallery, visit the gallery’s Facebook page.